Boston and Northeastern Massachusetts Christmas Tree Farms: choose-and-cut Christmas trees, Tree lots with pre-cut trees, stands, sleigh rides, hay rides and related winter events and fun! Whether you want to cut your own tree, pick a live tree and have it cut for you, buy a tree already cut or buy a living tree you can plant, this page provides detailed listings of Boston and Northeastern Massachusetts's choose-and-cut Christmas tree farms, places to buy pre-cut (also called pre-harvested and fresh-cut) trees, stands, sleigh rides, hay rides and related winter events and fun. Some listings are for tree farms, others are tree lots, and some only offer hay rides, sleigh rides or other winter events. READ EACH LISTING to know what each facility offers. The farms are listed further down this page, so scroll down the page! Since this service is free and open to ALL Christmas tree farms, not just those who belong to an association or pay for an ad, like almost all other websites do, this is the most complete and current listing available! I'm always looking for more to add, and to correct any inaccuracies or errors, so if you encounter any, please email me ! And please tell the farmer you visit in Boston and Northeastern Massachusetts that you found their farm here! I need the farmers to realize that you found them here so that they will keep their information up to date! 300 Dodge Street, Beverly, MA 01915. Phone: 978-778-5832. Open: November 23, 24, 25 and December 1st and 2nd from 9 am to 4 pm. Directions: Click here for a map and directions. Payment: Cash, Check. Our farm is situated on 27 acres of beautiful open space. Our trees are expertly pruned and extremely healthy. We donate all our profits to a local charity. Please visit our website to view our video and learn more about our farm. You-Choose and You-Cut varieties: Balsam Fir, Blue Spruce, Douglas Fir, Fraser Fir, White Fir (Concolor Fir). 38 Felton Street, Peabody, MA 01960. Phone: (9785317456. Fax: 9785311631. Email: Brooksby@peabody-ma.gov. Directions: Rt128 to Rt114 Call for more directions. Open: June to February 9 am to 5 pm; Seven days week Strawberry start in mid June; Apples start Sept 6 Peach mid Aug. Payment: Cash, Check, Visa/MasterCard, Discover, AmEx. PreCut varieties: Colorado Blue Spruce, Douglas Fir, Fraser Fir. 65 School Street, Groveland, MA 01834. Phone: 978-372-9951. Email: CJDonovanNursery@Gmail.com. Open: Monday through Thursday 12 pm to 4 pm and Friday through Sunday 9 am to 4 pm beginning the weekend before Thanksgiving. Directions: Click here for a map and directions. We are certified organic for all crops! Payment: Cash, only. Crane Neck Tree Farm - Choose and cut your own Christmas trees, shaking, wrapping, hay rides. 112 Crane Neck Street, West Newbury, MA 01985. Phone: 978-363-1272. Email: CraneNeckTree@aol.com. Open: See their website for current hours. Directions: From I-95: take Exit 57; Rte 113, West 5.3 miles to overhead blinking yellow light, take left onto Crane Neck Road, and proceed approximately 1 Mile to farm. Tractor hayrides on weekends only. Christmas tree varieties: Blue Spruce, Norway Spruce. Balsam Fir, Fraser Fir, Douglas Fir, Canaan Fir. Crane Neck Tree Farm - Precut Christmas trees, shaking, wrapping, hay rides. Wood Street, Groveland, MA 01834. Phone: 978-363-1272. Email: CraneNeckTree@aol.com. Open: See their website for current hours. Directions: entrance between 17 and 19 Wood Street. Remember, Thanksgiving is very late this year and we are selling Douglas Fir, our longest-lasting variety of tree, at Wood Street. Don't be afraid to come early for great selection! 114 Ash Street, West Newbury, MA 01985. Phone: (978) 363-2622. Directions: Call for directions. Open: November 25 to 12/23, 9 am to 5 pm. Christmas tree varieties: Blue Spruce, Fraser Fir, Concolor Fir. Comments from a visitor on December 17, 2011: "Evergreen Farm in West Newbury, Ma is sold out for 2011 season. I called today and they are closed (for the season)." 1100 North Broadway. Haverhill, MA 01832. Phone: (978-374-9466. Open: 12/4/- 12/12: weekends, Saturday 9 to 4, Sunday 12 to 4. Directions: From I-495: Exit 50 (Rte) 97, straight across Rte 97 onto Monument Street, turn left at first stop sign onto N. Broadway. Proceed 2.8 miles, farm on left, sign in front. Christmas tree varieties: Blue White Spruce, Balsam Fir, Concolor Fir, Canaan Fir, Scotch Pine and White Pine. 17 Herrick Road, Boxford, MA 01833. Phone: (978) 835-1583. Email: fgforestry@aol.com. Open: in 2018, November 23, 24, 25 from 9 am to 4 pm, December 1, 2 from 9 am to 4 pm, December 8, 9 from 9 am to 4 pm, and December 15th from 9 am to 4 pm. Click here for current open hours, days and dates. Directions: Click here for a map and directions. Payment: Cash, Check. we have premium 8 ft precut Balsam firs. U-Choose and Cut varieties: Canaan Fir, Fraser Fir, White Fir (Concolor Fir). You Choose and We cut varieties: Canaan Fir, White Fir (Concolor Fir), Fraser Fir. 26 Old England Road, Ipswich, MA 01938. Their Facebook page says they are closed. 167R Nelson Street, Georgetown, MA 01833. Phone: 978-352-6668. Open: Call for dates and hours. Payment: Cash, Check. Poinsettias also available at on-site greenhouses. You-Choose and You-Cut varieties: Balsam Fir, Blue Spruce, Canaan Fir, White Fir (Concolor Fir), Douglas Fir, Fraser Fir, White Pine. 102 Moulton Street, West Newbury, MA 01985. Phone: 508 641-5955. Email: Johnelwell@verizon.net. Open: After Thanksgiving Monday through Friday by appointment Weekends after Thanksgiving from 9 am Until 4 pm. Click here for current open hours, days and dates. Directions: Click here for a map and directions. We minimize use of pesticides and other chemicals. Payment: Cash, Check. A crafts table, marshmallow toasting, and Christmas tree setting and a sleigh for picture taking are all provided free. We provide Christmas tree carriers, saws, and twine. We also shake and bale your tree. We offer complimentary: hot chocolate, marshmallow roasting, ornament art creation, Christmas tree cutout for pictures, and wagon rides for our guests. We also have for sale Christmas swags, tree ornaments and Christmas season decorative signs (which are made at the farm), tree stands, and white birch logs. In 2017, Our trees are regularly $65.00 tax included. Our $30.00 table top and taller slender trees are sold out. We have trees from 3 feet to 12 feet tall. You-Choose and You-Cut varieties: Balsam Fir, Canaan Fir, Douglas Fir, Fraser Fir. You Choose and We cut varieties: Balsam Fir, Canaan Fir, Douglas Fir, Fraser Fir. 259 Linebrook Road, Ipswich, MA 01938. Phone: 978-356-0430. Alternate Phone: 978-356-3899. Fax: 978-356-3055. Email: mjmarini@yahoo.com. Open: from Saturday November 16th, then Monday through Thursday 10 am to 8 pm, Friday & Saturday 9 am to 9 pm and Sunday 9 am to 8 pm. Directions: South Merge onto I-95 N toward N.H. / MAINE Merge onto US-1 N / Newburyport turnpike via Exit 50 toward Topsfield Turn Right onto Linebrook road 259 LINEBROOK RD is on the LEFT. South Merge onto I-95 S toward Seabrook/Boston (Portions toll) (Crossing into MASSACHUSETTS) Merge onto MA-133 E via EXIT 54 toward Rowley Turn RIGHT onto US-1/Newburyport Turnpike. Turn Left onto Linebrook RD Marini Farm is on the LEFT. Click here for a map and directions. Corn maze is open September 11th through November 7th Haunted campfire Stories October 16th Christmas on the Hill opens November 20th. Payment: Cash, Check, Debit cards, Visa/MasterCard, AmEx. Click here for our Facebook page. Christmas on the Hill at Marini Farm features a selection of more than 2,000 pre-cut trees to choose from, a full selection of wreaths, holiday greenery, giftables, delicious holiday baked goods. We also host many holiday events for the family as well as for the individual. PreCut varieties: Balsam Fir, Douglas Fir, Fraser Fir. 11 Haskell Court, Essex, MA 01929. Phone: 978-768-6206. Email: kmgertsch@gmail.com. Open: Every Saturday and Sunday from 9 am to 4 pm from after Thanksgiving until before Christmas. Directions: From Route 133 in Essex, next to Schooner's Market, take Haskell Court. Tree sign will be at end of our driveway clearly indicating our location. Click here for a map and directions. Payment: Cash, Check. You-Choose and You-Cut varieties: Scotch Pine, White Spruce. You Choose and We cut varieties: Scotch Pine, White Spruce. 315 S Bradford St, North Andover, MA 01845. Phone: (978) 682-6332. Email: inform@smolakfarms.com. Open: Fields are open from 9 am to 4 daily; Check our facebook page for the latest crop of the day!. Directions: Click here for a map and directions. Payment: Cash, Debit cards, Visa/MasterCard, AmEx. Click here for our Facebook page. Many family traditions begin at Smolak Farms when they go out into our fields to choose and cut their Christmas tree! The varieties of trees that we grow on the Farm are Fraser Fir and Douglas Fir. We recommend that you come early to cut your own tree as we tend to sell out each season. Please know that if we do not have a tree that you desire in our fields, we offer pre-cut Christmas trees as well in the lot near the farm stand.We will offer pre-cut and cut-your-own trees on our picturesque farm complete with our fallow deer. We will have cut Balsam and Frasier Firs from five feet and to a soaring sixteen feet. Our staff is happy to assist you in netting and securing your cut tree. In addition to trees, we will have other seasonal items to make your home festive. Whether it be wreaths, kissing balls or roping, we have something for every home. We have cut your own Frasier & Douglas Fir trees. We will supply the saws and the twine to tie the tree to your car. Netting services will be available behind the Farm Stand if desired. U-Choose and Cut varieties: Balsam Fir, Douglas Fir, Fraser Fir. You Choose and We cut varieties: Fraser Fir. 73 Mudnock Road, Salisbury, MA 01952. Phone: (978-465-3037. Open: from the day after Thanksgiving until December 24th, from 8 am until dusk. Directions: From Rte 95 North: Exit 58A (110 East), go approximately 1 and 1/2 miles to Mudrock Road, to (1st right after dairy Queen). Payment: Cash only. ALL TREES ARE $65.00 AND WE DO NOT PERMIT TAGGING. WE SELL OUR TREES ON A FIRST COME, FIRST SERVE BASIS. U-Choose and Cut varieties: Blue spruce, Balsam Fir, Fraser Fir, Douglas Fir, Concolor Fir, Canaan Fir. 380 Middle Rd, Haverhill, MA 01830. Phone: 978-372-9474. Email: turkeyhillfarm@comcast.net. Open: 8:30 AM to 4 PM weekends in November before Thanksgiving and every day after until December 14th . Directions: From I-495: take exit 52 and go east on Route 110, (toward Merrimac) one mile. Turn right onto Middle Road. Turkey Hill Farm is 7/10 of a mile on the right. Click here for a map and directions. We minimize use of pesticides and other chemicals. Payment: Cash, Check. tag and cut in November and December! Tagging always starts the first weekend in November. Our 2013 price for most trees is $65, none higher. Some "interesting" trees are marked much lower, some as low as $10. Many "interesting" trees are full size this year. We have lots of Fraser Fir and Douglas Fir. There are very few Blue Spruce. We have some nice Canaan Fir, they are similar to Fraser and Balsam fir. Most trees are 6 to 8 feet. Taller trees will sell out early. Our secure tagging system means you will get the tree you tag. We expect full payment at the time of tagging. We accept cash or checks. You can return and cut the tree yourself or arrange for us to cut it for you. The price includes cutting, shaking, wrapping and drilling. We provide free hot or cold apple cider, toilet facilities, tree carts and saws. We also sell tree bags and very easy to use stands. Please leave your pets and credit cards safely at home. Click here for our Facebook page. You-Choose and You-Cut varieties: Blue Spruce, Douglas Fir, Fraser Fir. You Choose and We cut varieties: Blue Spruce, Douglas Fir, Fraser Fir. White Gate Farm - Christmas trees-you choose and you cut, wreaths, roping, shaking, wrapping, gift shop, hay rides. 28 Ash Street, West Newbury, MA 01985. Phone: (978-363-2224. Email: KellyFarm@aol.com. Open: 9am to 4 pm on weekends; starting the day after Thanksgiving and the first 2 weekends in December. We will also be open select week days to accommodate those who are unable to make it during the weekend! We ask that you contact us to see if we are open before coming down to the farm on weekdays.Directions: From South: I-95 North to Newburyport/W. Newbury exit; take left & go approximately 5 miles to W. Newbury Center. At Citgo Station, take left onto Maple Street, & go 7/10 mile: take left onto Ash St.
Christmas tree varieties: Blue spruce, Balsam Fir, Fraser Fir, Douglas Fir, Concolor Fir, Canaan Fir. 32 Nixon Road, Framingham, MA 01701. Phone: (508) 877-7256. Email: bbxmastree@gmail.com . Open: Saturday, November 25, from 9 AM to 12 PM; Saturday, December 2, from 8 AM to 2 PM; Sunday, December 3, from 10 AM to 2 PM. Directions: Click here for a map and directions. We use integrated pest management practices. Payment: Cash, Check. Our 40th year. $80 for any size tree. Cash or check only, no credit cards. Free greens with every tree purchase. See you at the farm. Our 40th Year! Free greens with every tree purchase. Any size tree $80. Plenty of tall Norway Spruce! U-Choose and Cut varieties: Balsam Fir, Colorado Blue Spruce, Fraser Fir, Norway Spruce, White Fir (Concolor Fir), White Spruce. Acton, Massachusetts. Phone: 978-263-7165. Email: equine@ultranet.com. Directions: We are located off Route 2A/119 (behind Nagog Park) at the Acton-Littleton Line. Approximately 1 hour and carries up to 20 adults. The Wagon or Sleigh are pulled by a matched team of Belgian Horses, Mack & Marc. These rides are available for parties, family outings and company gatherings. Bobby's Ranch, Inc. offers scenic western style trail rides, year-round on over 1500 acres of conservation land. Our rides are available every hour on the hour for an hour. From 9 AM to 4 PM, everyday, except Tuesdays. We are closed on Easter, 4th of July, Thanksgiving and Christmas. D.J. Hussey Farm - Choose and cut Christmas Trees, Wreaths, Roping, Christmas shop. 20 Burgess Road, Townsend, MA 01469. Email: djhussey@comcast.net . Open: November 25 to 12/24: weekends 9 am to 5 pm; weekdays, 3 to 6 pm. Directions: Take Rte 119 to Townsend center, North on Rte 13 to Dudley Road, 1/2 mile to Burgess Road. U-Choose and Cut varieties:Blue Spruce, White Spruce, Balsam Fir, Fraser Fir, Douglas Fir, White Pine. 146 Tahattawan Road, Littleton, MA 01460. Phone: (978) 486-4449. Email: loucat@verizon.net . Open: from November 26 and following weekends until sold out, from 9 am to 3 pm; closed weekdays. Directions: From I-495, take exit 30 right, 500 ft. to traffic island and historical society bldg, right past fire station, then one mile uphill to 146 Tahattawan Road, From Rte 2, take exit 41 toward Littleton, then one mile to 146 Tahattawan Road. U-Choose and Cut varieties:Balsam Fir, Fraser Fir, Concolor Fir, Canaan Fir. 96 Dudley Rd, Billerica, MA 01821. Phone: 978-667-5380. Email: cardbee@aol.com. Open: Starting the Saturday afterThanksgiving; Tuesday to Friday from 12 pm to 4 pm; Saturday and Sunday 9 am to 4:30 pm. Directions: Located between Rtes. 495 and 95 midway between on Rte. 3. Take Exit 27, Concord Road Take a left off from the ramp (toward Bedford). Take the fourth right turn, Dudley Road Go 3/4 of a mile go straight at the stop sign. Go 1/2 mile and see the farm on the left. Click here for a map and directions. Payment: Cash, Check. Click here for our Facebook page. Located on a Farm settled in 1689. We have free Hot Cider and our own Honey for tasting and purchase. Cookies and Cider Doughnuts are also available. Farm Animals and Christmas Music add to the festive atmosphere. You-Choose and You-Cut varieties: Balsam Fir, Fraser Fir. You Choose and We cut varieties: Balsam Fir, Fraser Fir. PreCut varieties: Balsam Fir, Fraser Fir. 166 Lake Drive, East Hampton, MA 06424. Phone: (860) 267-4159. Email: Hazentreefarm@hotmail.com. Open: Hours for 2009, for the dates of December: Thursday 3rd - Sunday 6th/ Thursday 10th - Sunday 13/ Thursday 17th - Thursday 24th Christmas Eve; We are open from 8:30am to 4:30pm on the above dates; our season starts the day after Thanksgiving and is open to Christmas Eve. . Directions: From Hartford: Take Route 2 East to Exit 13. Take a right at top of ramp. Stay on Route 66 West for 3 Miles Take a right onto Staeth Rd Farm is 1/2 Mile down the road on your left. From Middletown/Portland From CT 66 & CT 17 Go 10 miles take a left onto Lake Drive; At the stop sign go left; the farm is 300 yards down on your left. From Colchester/Norwich Take CT 2 to Exit 13 At top of ramp go left Stay on Route 66 West for 3 Miles Take Right onto Staeth Rd Farm is 1/2 Mile down the road on your left. We minimize use of pesticides and other chemicals. Payment: Cash, Check. Celebrating our 45th season in 2009. Started by Reg Hazen in 1964. Since Reg's passing Hazen Tree Farm has been run by Reggie's Children and Grandchildren. The farm is Located on 80 beautiful acres of forest in East Hampton, CT. The Farm itself takes up about 3 1/2 acres. We offer no hassle shopping in beautiful quite setting. He hope too see you down on the farm in 2009. You-Choose and You-Cut varieties: Blue Spruce, White Fir (Concolor Fir), Douglas Fir, Fraser Fir, White Fir (Concolor Fir). You Choose and We cut varieties: Blue Spruce, White Fir (Concolor Fir), Douglas Fir, Fraser Fir, White Fir (Concolor Fir). 71 Burlington Street, Woburn, MA 01801. Phone: 781-933-9815. Email: heimlichnursery@verizon.net. Open: Monday to Saturday 8 am to 5 pm Sunday 9 am to 4 pm. Directions: route 95 to exit 33a to Cambridge road take a left on Bedford road and then a right onto Burlington street. Click here for a map and directions. Payment: Cash, Check. 117 Mill Street, Sherborn, MA 01770. Phone: (508) 653-5421. Email: farm@hopestill.com. Open: Summer and Fall Roadside Stand: Everyday from 8 am to 6 pm; December Christmas Trees: 10 am-4pm on Saturdays and Sundays after Thanksgiving; that may change, so check our website for most accurate hours. Click here for current open hours, days and dates. Updates: Click here for updates. Directions: From Route 27: Turn onto West Goulding Street (Right if going South, Left if going North) and continue for .5 miles. Continue as West Goulding turns into Woodland Street for another .1 miles. Bear left at the fork onto Mill Street and continue for 1 mile. At the four-way intersection of Mill Street and Hollis street continue across and turn left in the first driveway, this is Hopestill Farm. For directions from other locations, or to see a map of our location, please click on the directions link. Click here for a map and directions. Payment: Cash, only. All products sold at Hopestill Farm are certified organic. Hopestill Farm is also a Massachusetts Century Farm. People can also call for an appointment for some other time during the week. We have a large selection of cut-you-own, certified organic Christmas trees, white spruce and blue spruce. Make a cut-your-own Christmas tree from Hopestill Farm part of your holiday tradition. We begin tagging in early November. You-Choose and You-Cut varieties: White Spruce. 169 Berlin Rd, Marlboro, MA 01752. Phone: 508-485-1609. Email: info@houdetreefarm.com. Open: Click here for current open hours, days and dates. Directions: Click here for a map and directions. And Click here for a coupon. Payment: Cash, Check. You will always receive friendly & efficient service at our farm. Houde's Christmas Tree Farm has been a family-run tree farm for over 30 years. We care about our farm and our customers. We see many of the same faces year after year, even some who remember when our grandparents sold the trees. You-Choose and You-Cut varieties: Balsam Fir, Blue Spruce, Canaan Fir, Fraser Fir, White Fir (Concolor Fir), White Pine. 702 Braodway Rd, Dracut, MA 01826. Phone: 978-726-3115. Email: christi-enwright@yahoo.com. Open: Monday to Friday 4 pm to 9 pm Saturday and Sunday 9 am to 9 pm. Directions: Click here for a map and directions. Payment: Cash, Check, Debit cards, Visa/MasterCard, Discover. 149 Whitman Street, Stow, MA 01775. Phone: (978) 298-5688. Email: markharnett@comcast.net. Open: Hours vary, please see our website for updates; Sunday, November 18 9 am to 4 pm Wednesday, November 21, noon - 4 pm Friday, Saturday, Sunday November 23, 24, 25, 9 am to 4 pm Friday, November 30 2 pm to 7 pm Saturday, Sunday December 1, 2, 9 am to 4 pm Friday, December 7, 2 pm to 7 pm Saturday, Sunday December 8, 9, 9 am to 4 pm Friday, December 14, 2 pm to 7 pm Saturday, Sunday December 15, 16, 9 am to 4 pm Please call ahead or check website to confirm hours, we close for season when trees are all sold. Directions: We are located in Stow, MA, please see our website for directions. Address 149 Whitman Street, Stow, MA 01775. Click here for a map and directions. Payment: Cash, Check. We are a small 'classic' tree farm. Family-owned, family-run. Look for the giant red Christmas tree barn. U-Choose and Cut varieties: Balsam Fir, Blue Spruce, Canaan Fir, Colorado Blue Spruce, Fraser Fir, Norway Spruce, White Fir (Concolor Fir). PreCut varieties: Fraser Fir, and other varieties (call!). North Pole Xmas Trees - Precut trees Christmas trees, in all sizes and grades. Premium wreaths & exotic garlands. As well as Supplies like Tree Stands and Mistletoe. 163 Pawtuckett Boulevard, Lowell, MA. Phone: 603-930-1291. Email: info@northpolexmastrees.com. Directions: From 93 South. To South on Everett Turnpike. Take exit #35 to TYNGSBORO/DUNSTABLE. Go left off exit and follow signs for 113. Follow road over bridge and bear right. Follow river into Lowell on 113, becomes Pawtucket Boulevard. Lawndale Farm Stand, 91 Frost Road, Tyngsboro, MA. Phone: (978 808 6164. Email: info@northpolexmastrees.com. Directions: From Hudson, Just 3 miles south of Walmart, 1 mile past Ayottes. From the Pheasant Lane Mall, continue south on Daniel Webster Highway into MA. When you reach the big green bridge in Tyngsboro take a left. We are a mile up on the right. 1413 Vaenum Ave, Lowell, MA 01854. Phone: 978-458-0626. Email: ljr1@comcast.net. Open: November 29th Tuesday thru Sunday 9 am to 4 pm (Closed Monday); Tuesday to Friday from 12 pm to 4 pm. Directions: Click here for a map and directions./a> Payment: Cash, only. Click here for our Facebook page. Korean Fir, Corkbark Fir. You-Choose and You-Cut varieties: Balsam Fir, White Fir (Concolor Fir), and other varieties (call!). Silveus Plantation - pre-tagging is allowed, wreaths. 1 Kemp Street, Dunstable, MA, 01827. Phone: (978-649-6086. Open: the day after Thanksgiving to 12/21, Monday to Friday 2 pm to 4 pm, weekends 10 am to 4 pm . Directions: Rte 3 to Rte 113 to Groton Street, then East onto Kemp Street. 421 Bolton Street (Route 85), Marlborough, MA 01752. 4465 North Avenue Hall Park adjacent to Veterans Field, Wakefield, MA 01880. Phone: 781-944-9622. Email: volunteer@wrysc.org. Open: Sunday to Saturday, All days, 10 am to 9 pm, November 26 to December 23. Directions: Take Route 128/95 to Exit 39 for North Avenue (Reading/Wakefield). Turn South on North Avenue toward Wakefield. Follow for .8 mile. Hall park and Veterans ballfield parking is on the left. Click here for a map and directions. Payment: Cash, Check. We are an all-volunteer service organization affiliated with the YMCA. We have been selling Christmas trees at this site for over 40 years. Proceeds from the annual sale provide financial aid for children and families in the communities of Reading, Wakefield, Stoneham, Wilmington and North Reading through the Burbank Our organization serves as both a human and financial resource for the YMCA. Our primary objectives are to support the Burbank YMCA in Reading (formerly the Wakefield YMCA) and Camp Wakanda, a Summer day camp run by the YMCA. All proceeds from our sale go directly to supporting the YMCA and their objectives. Thank you for your support. PreCut varieties: Balsam Fir, Douglas Fir, Fraser Fir, White Fir (Concolor Fir). 25 Birch Street, Millis, MA 02054. Phone: 617-803-0493. Email: gdowd@landscapedevelopmentinc.com. Open: See web site for current hours. Click here for current open hours, days and dates. Directions: Click here for a map and directions. Open for Christmas trees from the day after Thanksgiving until the last Saturday before Christmas. Payment: Cash, Check. We have pre cut trees, fresh wreaths, and garland, as well as a wide variety of choose and cut and live trees that are grown year round on our farm, while at the same time, creating a fun, family atmosphere, Santa, fire pit, and even some free coffee and hot cocoa, to take the chill off. You-Choose and You-Cut varieties: Balsam Fir, Black Hills Spruce, Blue Spruce, Canaan Fir, White Fir (Concolor Fir), Douglas Fir, Eastern White Pine, Fraser Fir, Noble Fir, Norway Spruce, White Fir (Concolor Fir), White Pine, White Spruce. 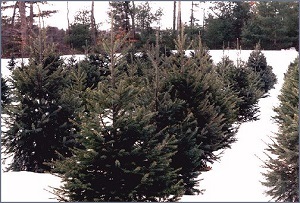 PreCut varieties: Balsam Fir, Canaan Fir, White Fir (Concolor Fir), Douglas Fir, Eastern White Pine, Fraser Fir, Noble Fir, Norway Spruce, White Pine. Living, rooted tree varieties: Balsam Fir, Douglas Fir, Noble Fir, Norway Spruce. 887 Lincoln Street, Franklin, MA 02038. Phone: 508-533-8737. Email: info@fairmountfruit.com. Open: Monday to Friday, from 9 am to 8 pm; Saturday and Sunday, from 9 am to 6 pm, November 26th to December 24. Directions: Click here for a map and directions. Payment: Cash, Check, Debit cards, Visa/MasterCard, AmEx. We also carry handmade wreaths, swags and kissing balls. You can choose from either hand decorated wreaths or kissing balls or decorate them yourself using our wide selection of wreath decorations and handmade bows. Our Farmstand has a variety of other goods are available in addition to our Christmas products... Baked Goods: Cookies, fruit breads, Fudge and of course our popular apple fritters! Bake at Home Frozen Pies, Gift Baskets, Fresh Eggs, Freezer Lamb, Local Honey and other products from small farms and businesses in the area. Hancock Tree Farm - Pre-tagging is allowed. 508 Hancock Street, Wrentham Norfolk, MA 02093. Phone: 508) 384-2056. Open: 10/30 to 12/19, Saturday and Sunday, only, 9 t0 4:30. Directions: From I-495: Exit 15 toward Plainville. Right on Green Street, Left on High Street, Right on Hancock; about 1 mile down on left. Christmas tree varieties: White Spruce. 160 Granite Street, Foxboro, MA 02035. Phone: (508) 543-7081. Email: info@indianrockfarm.com. Open: UPDATE: December 08, 2018: Sold out of trees; They are closed until next season (2019), when their hours should be: Weekends only, starting November 27, 9 to 4. Directions: Rte 140 to Foxboro center, take 1st left on Rte 140 North of Foxboro Town ComMonday, Granite Street, Farm one mile down on left. 1040 South Main Street, Bellingham, MA 02019. Phone: 508-883-4787. Fax: 508-883-4787. Email: L8vue@aol.com. Open: UPDATE for 2018, Their website is gone; Does anyone have current information, are they still in business and open? If so, please write me, their last reported hours were please call because they vary at different times of the year Our tractor drawn hayride tours our 97 acre farm from April to November. Directions: see our web-site And for a map to our farm, Click here. During the months of September and October we have pumpkin patch hayrides and haunted hayrides. We have assorted animals for the children to see. Our farm restaurant serves our homegrown turkeys. Payment: Cash, Check, Visa/MasterCard. credit cards are accepted in the restaurant. 109 Elm Street, Canton, MA 02021. Phone: 781-828-0111. Email: info@pakeenfarm.com. Open: Please see our website for current business hours. Directions: Please see our website for directions to our farm. Click here for a map and directions. Payment: Cash, Check, Visa/MasterCard. Click here for our Facebook page. join us at the barn and in the fields to pick out your perfect Christmas tree, while you sip hot cocoa and take in the brisk New England air. We offer Choose & Cut trees, as well as Freshly Cut trees, wreaths, roping, and other holiday decorations. You-Choose and You-Cut varieties: Balsam Fir, Canaan Fir, Colorado Blue Spruce, Fraser Fir, Norway Spruce. You Choose and We cut varieties: Balsam Fir, Canaan Fir, Colorado Blue Spruce, Fraser Fir, Norway Spruce.